A: The best idea is estimate the amount of traffic in the busy season. The number of pump out units you will need depends on how many boats you intend to service at once. Many marinas with 100 slips or more typically have between two and eight pump out collection systems. To extend the life of the pump out, select a pump out system with an enclosure to protect it from the elements. 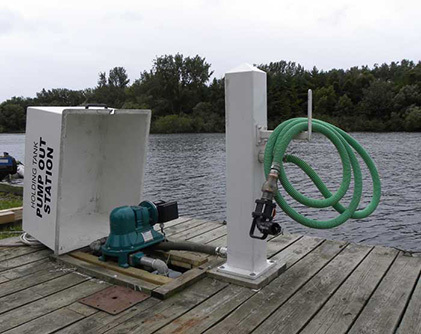 Most marinas are able to use a 1.5” pump connection with universal attachments to pump out any size of boat holding tank. The pump stations can connect to a larger pump unit to move the wastewater to another area like a collection basin. Wastecorp also recommends Vacuum Pumps for higher suction needs in multi-slip marinas. Our Super Duty Marine Pump Out Systems can pump out up to four boats at the same time. Check out your marine vacuum pump options here. Pumping the wastewater up a 100 ft hill to a holding tank would require a strong enough pump to move the bilge waste up the incline. We would typically recommend a 4” double diaphragm pump or even a 3” self priming centrifugal pump. A basic sketch or photographs of your docks and facility can be of great assistance to your customer service representative when calling in so be sure to include these if you can.